If your horse gently chews the bit occasionally, that's actually a good sign. She's relaxed and comfortable. If she's constantly and aggressively chewing the bit, that's another story. Solving the problem might be as simple as changing the bit or having work done on her teeth, or it could involve a lot of trial and error. If your horse constantly chews at the bit for no apparent reason, make an appointment with your veterinarian for a dental appointment, even if your horse is up-to-date on her annual teeth floating, or filing. If you use a nonveterinarian "equine dentist" to float your horse's teeth, it's possible her mouth needs more attention than such a practitioner can provide. Equine dentists aren't licensed to use sedatives on horses, so if a horse has a behavioral problem, they are limited in the work they can do. A veterinarian, especially one specializing in dentistry, can examine your horse's mouth fully to see what's bothering her. He can schedule corrective surgery or prescribe medication, if necessary. Finding the right bit for your horse is as much an art as a science. Young horses are generally started in mild snaffle bits. You have a choice of stainless steel, rubber, copper or other materials, along with differences in the types of snaffle. With bits, one size does not fit all. If your horse constantly chews or fusses with the bit, she might be telling you it's bothering her mouth. When choosing a bit, you must take into consideration the tongue thickness, the height of the palate, the mouth's width and the general shape of your horse's head. If your mare chews excessively on one type of bit, try a similar bit of another material or size to see if it makes a difference. It's not uncommon for young, green horses to exhibit excessive bit chewing. The whole experience of training is new to them, as is having this metal or rubber object in their mouth, so the chewing can result from nervousness. Practical Horseman magazine recommends allowing young horses to become accustomed to the bit without having to deal with a rider or other training issues at the same time. It advises taking the reins and noseband off the bridle, then putting the remainder of the bridle with the bit on your horse. Leave her safely in a stall for about an hour so she can relax and hang out with the bit in her mouth. Keep an eye on her during this period. Many horses will stop the excessive chewing after a few of these daily sessions. 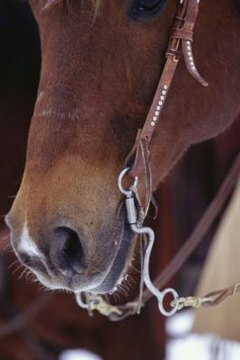 If you're working with a trainer and a veterinarian on your horse's excessive chewing and nothing seems to work, consider using a bitless bridle. Some horses just don't like having a bit in their mouth and will perform better without one. The hackamore or bosal has long been used in western disciplines. These devices must be fitted carefully to the individual horse to be effective. They work by putting pressure on the nose and chin to guide and stop the horse. While the bitless bridle also works via pressure, it involves the entire head and does not inflict any type of pain response.